The new space is “almost whimsical,” a perfect fit for the company’s playful brand. Flyers appreciate the visual “line-of-sight” to their co-workers in the new open office. Photo courtesy of Radio Flyer, Inc. When it came time to refresh Radio Flyer’s headquarters in Chicago, it was important to build creativity and imagination and the same delight that Radio Flyer wagons, trikes and bikes have evoked within its customers for a century within the architecture and design of the space. Gensler managed to do that by taking the former manufacturing warehouse and transforming it into a uniquely authentic and inspirational place to work and innovate for the next 100 years. Who was the building architect? Radio Flyer’s new space encourages the playful spirit they bring to their products. Photo courtesy of Radio Flyer, Inc.
It’s about 316 square feet per person at the current occupancy. The current headcount includes 72 staff, referred to as Flyers, and 15 interns, with 75 as the average daily population. The office is conveniently located within walking distance to both the Metra Rail train and the Chicago Transit Authority bus. We used Herman Miller sit/stand stations for all staff, even the CWO. Everyone also has Knoll generation task chairs. The collaboration area employs Bernhardt Mitt chairs, which have handles that allow them to be easily reconfigured. Radio Flyer’s refreshed entrance. Photo courtesy of Radio Flyer, Inc. Most people are in the office every day. We built the space with collaboration in mind and created spaces like the “Engine Room” for product development. Everyone has an assigned work station. 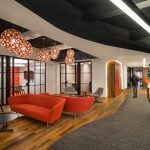 However, there are some shared, unassigned areas, including about 10 conference rooms, the Radio café, the wellness room, the wellness zone, and the den, among others. There are also empty work stations that are available for visitors in the existing pods or they can work in the den, the playground or the Radio café. Capturing the emotion of a brand that has been a platform for imagination and delivered smiles for 100 years, Radio Flyer’s refreshed manufacturing warehouse is now a uniquely authentic and inspirational place to work and innovate for the next 100 years. For instance, the Heritage Area celebrates the brand’s legacy of innovation by displaying products, ranging from the original Liberty Coaster wagon to the cans of gasoline they manufactured during WWII. The spaces tell the stories of the products in context with world events through larger-than-life picture frames, wall displays and nostalgia. The Heritage Gallery showcases photos of the Pasin family, the company’s founders. Photo courtesy of Radio Flyer, Inc. The workplace celebrates the history of the family with a floorplan reminiscent of a home. The kitchen and café has a 32-foot communal table that anchors the space, providing a humble place for co-workers to socialize and collaborate. The den is an open working lounge with flexible seating that is reimagined throughout the course of each day to support the needs of their employees, the Flyers. The play lab is a unique product-testing area, where prototypes are evaluated in a flexible teaming area by way of an expansive one-way window. The space is labeled the test track, inviting kids to wonder, imagine, and play in an open sky-lit area with acoustic murals on three of its walls. Local artist Anthony Lewellen animated the space with a vibrant mural. Photo courtesy of Radio Flyer, Inc.
Chicago artist Anthony Lewellen animates the west wall of the workplace with a vibrant and interpretive mural, above which a portion of the original overhead wagon transport system was restored. Wagons are displayed like they were 80 years ago, flying overhead from the paint station toward the drying area. With views to the backyard, the sun-filled space honors the building’s history while providing Flyers with a work environment that balances health, technology and well-being. The backyard was created after portions of the manufacturing buildings were demolished, making way for an amazing outdoor amenity for the employees. Its lush landscape is comprised of native and adaptive plantings, diverse walking paths and a central lawn space that accommodates group activities and picnics. It also contains a cistern to capture rainwater, geothermal technology, and a bioswale network, all of which contributed to it being certified as a LEED Platinum project. A Radio Flyer wheel floor detail. Photo courtesy Radio Flyer, Inc.
It’s hard to pick just one! The heritage wall, the mural and the backyard are Gensler’s top three! The overwhelming majority of comments have been positive. We’ve received the most feedback on how pleased the Flyers are with the effective sound control; the space is a lot quieter than they expected. The natural light is also brighter than the Flyers expected, especially for those whose workstations are near the backyard patio. All in all, the change was easy for most, and everyone loves the standing/sitting desks. Radio Flyer’s new cafe. Photo courtesy of Radio Flyer, Inc.
Flyers appreciate the visual “line-of-sight” to their co-workers, the open environment allows them to see if Flyers are at their desk if they need to walk over and talk with them. The café and comfortable meeting spaces have also been very effective at bringing Flyers together for more informal discussions. The new 30-foot channel glass façade is lit with programmable lights that change the color of the building and display light patterns during the day and evening. Also, the newly designed façade has angled portions, which resemble a cracked open door – inspiring visitors and employees alike to wonder what is possible behind that door. It’s a great and simple – almost whimsical –delight. Nice One! The flyer is the most important thing for marketing and advertisement.